Kita-Sabae Station (北鯖江駅, Kitasabae-eki) is a railway station on the Hokuriku Main Line in the city of Sabae, Fukui Prefecture, Japan, operated by the West Japan Railway Company (JR West). Kita-Sabae Station is served by the Hokuriku Main Line, and is located 89.4 kilometers from the terminus of the line at Maibara. The station consists of one island platform connected to the station building by a footbridge. The station is unattended. Kita-Sabae Station opened on 1 May 1955. With the privatization of Japanese National Railways (JNR) on 1 April 1987, the station came under the control of JR West. In fiscal 2016, the station was used by an average of 477 passengers daily (boarding passengers only). ^ 駅別JR貨客輸送状況(1日平均) [Station passenger figures (Fiscal 2016)] (PDF) (in Japanese). 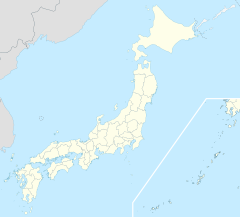 Japan: Fukui Prefectural Government. 2017. Retrieved 2 May 2018. This page was last edited on 21 July 2018, at 04:47 (UTC).